During a lunar eclipse, the Moon moves through the shadow of the Earth. This means that the Earth is positioned exactly between the Sun and the Moon and casts its shadow onto the Moon. This is only possible at the full moon and when some other requirements are met. Depending on whether the Moon passes the partial or the core shadow of the Earth, we speak of a partial or total lunar eclipse. When the Moon touches the core shadow of the Earth, the first parts of the moon surface begin to darken. If you would actually stand on the Moon, you would experience a total solar eclipse! As soon as the Moon immerses completely in the core shadow, the surface of the Moon begins to glow copper red. Towards the centre of the core shadow, the light fades and turns dark red to brownish grey. 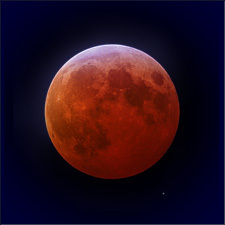 This total lunar eclipse will be visible in Europe, North, Central and South America. In Africa, the Middle and Near East it will be partially visible. It can't be seen in Asia, Australia and the Pacific.